Kleefeld on Comics: On History: Environmental Origins? A lot of what we experience as kids impacts us as adults. I sometimes find myself wondering why I like or dislike a particular thing, or why I grew up to think a certain way -- what did I experience as a child that impacted me in a way that would cause me to think/feel as I do today? 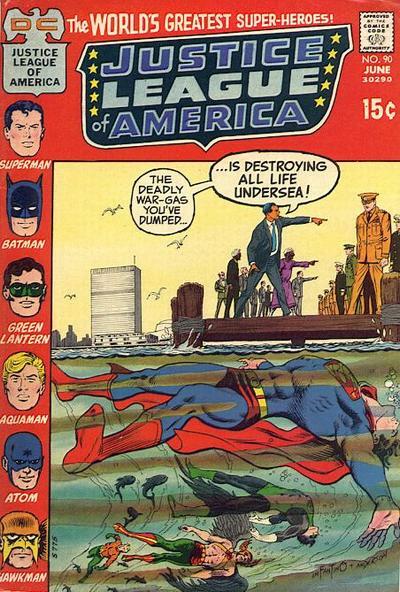 When I stumbled across my old copy of Justice League of America #90 the other day, I realized that probably was the first major encounter I had with environmentalism. I probably haven't cracked it open in thirty, maybe thirty-five years, so I decided to re-read it to see what exactly may have struck a chord with me. As it turns out, I must have totally mis-read the issue as a kid. It wasn't really an environmental story at all, despite my recollection of it being one. Probably due in large part to the cover. The gist of the actual story is the military (it's never specified which branch) dumped a bunch of "obsolete" poisonous gas into the ocean just to get rid of it. The dumping happens to crush the sacred "Proof Rock" of the underwater Pale People, and one of them takes that as a sign to use the gas to conquer Aquaman's Atlantis. 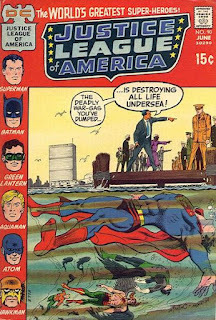 They quickly take over, but the death of an Atlantean found on the shore alerts Batman, Superman, Hawkman, Green Lantern, and Atom to a potential problem. The heroes go save Aquaman and take back Atlantis. Hawkman then instructs the Pale People how they might use the broken Proof Rock in a different manner than before. There are a number of problems with the story. The two beach-goers who find the dead Atlantean immediately recognize her as such, with no indication of how since she looks exactly like a human. How the Pale People go from having a boulder crushing their Proof Rock to using the gas weapons (which they'd never actually seen) to conquer Atlantis isn't really explained. How a gas weapon even works underwater is pretty murky as well. And somehow the Proof Rock becomes a Proof Rock Plant at the end of the story, and Hawkman seems to think that eating it is a sign of the faith they must have in their own souls. How do Hawkman's wings work underwater anyway? Batman is actually absent for most of the story because he's off searching for Flash, whose "special services" he suspects "will be needed on this case" -- um, since when does Flash have any powers that are unusually useful underwater? Not to mention a number of other smaller assumptions and leaps of logic writer Mike Friedrich seems to make. The next page shows Aquaman and much of Atlantis attending a mass funeral. So big props for including that sequence showing actual consequences. But the various storytelling problems, I think, led to my thinking it was more actively an environmental story. I thought the Proof Rock had been destroyed by the gas itself after it had been dumped, not some boulders that had been knocked loose by the gas canisters. The couple panels later of the Pale People letting loose the gas were drawn in such a way that I didn't really make the connection that they had fully harnessed the gas as a weapon; I think I must have thought they were only redirecting the already exposed gas. I suppose I must have read more into the cover, and made some assumptions about the story itself based on that. And I wonder if that's why I'm not more of an environmentalist. I got the basic message I think cover artist Carmine Infantino was trying to convey, but since it wasn't well reinforced by the contents, it only left me with a base level concern as opposed to being more activist about it. Or else it had no impact at all, and I got whatever concerns I have from other sources entirely. Regardless, I do find these types of inquires interesting to explore, even if they don't turn up any conclusive proofs. I think it's interesting that if you had that cover today some right wing loonies would complain it's pushing a leftist agenda. I've come to realize that's why Superman and Green Arrow can never be champions of the little guy any more.